Meat thermometers take the guesswork out of cooking. Meat thermometers are must-have tools in the kitchen. Stop guessing or worse, cutting into your food to see if it’s done. There are many types of meat thermometers and all of them provide the same services. They will prevent you and your loved ones from getting food poisoning from under-cooked meat. I use mine all the time. Not just for roasts and poultry…I check to make sure my casseroles and quiches are heated through too! Definitely, I want to ensure my hamburgers and meatloaves are safely done. Who the heck wants to get Salmonella or E. Coli?!?! If you don’t have one, there are many meat thermometers to choose from. And there’s nothing wrong with owning different types. I like using this type when I’m doing roasts. You insert the metal probe into the meat at the beginning of the cooking time. Near the end of the cooking time you can see the thermometer through the oven door and find out how things are coming along. There’s also another type that has a long probe attached to a heatproof wire. The probe goes into the meat at the beginning of the cooking time; the wire is attached to a digital monitor, which sits on the counter near the stove. It’s a bit more convenient. I use this one for steaks, chops and hamburgers. It gets used near the end of the cooking time. So while the food is cooking you just stick the probe in the meat and get a quick read on the temperature. Mine has a digital read out and I love it! There are also the “pop-up” types. Typically you’d use this one for chicken, turkey or other fowl. These are inserted at the beginning of the cooking time flush to the skin and when the meat is cooked, a small sensor just pops up. I have another thermometer, which is a ringing timer. I use it for chicken or turkey when I’m using the BBQ. You wind it up and insert it in the meat. When the meat is cooked the timer rings for about 10-15 seconds. There’s also a little tab that swings out in case you missed the ring while you were chatting with friends on the deck. I have to confess I’ve never used one. I don’t tend to cook with a microwave oven very much. And if I do re-heat something in there, I use my instant-read thermometer to test the temperature. What I can tell you is that they are made specifically for the microwave; so don’t use any other type if you’re cooking in the microwave. They are difficult to find, in my experience so far. How Reliable Are Meat Thermometers? First make sure you have the right thermometer. You don’t want to buy a candy thermometer in error. So just read the label and make sure it says it’s designed for meat and poultry. While you’re at it choose meat thermometers that have easy-to-read displays and are well constructed. If you’re not buying a digital thermometer, choose one that you can calibrate. It’s safe to say that most meat thermometers are accurate to within plus or minus 2 degrees Fahrenheit. The best way to find out how accurate yours is will be to test it. For that you need to boil water, dip the thermometer at least 2 inches into the water. If it reads 212 degrees Fahrenheit, which is the boiling point of water, then your thermometer is accurate. 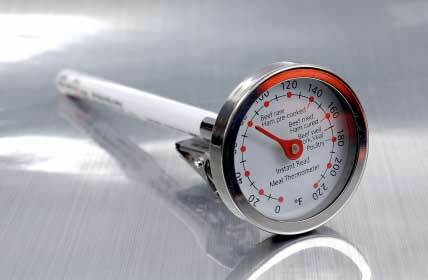 A good instant-read thermometer will have a calibration nut that you can use to adjust it. If you live at a higher altitude than 5,000 feet above sea level, the boiling point of water drops by 10 degrees to 202 degrees Fahrenheit, so keep that into consideration. Where Do You Stick The Darn Thing? Where in the meat do you place the thermometer? This is the most important thing to know when using meat thermometers. Placed incorrectly, you’ll get readings that say your food is ready when it’s not. The sensor or probe needs to be inserted into the inner area of the thigh near the breast BUT NOT TOUCHING the bone. This is very important. If there’s stuffing, the temperature of the stuffing itself needs to reach 165 degrees Fahrenheit. You’ll take the temperature at the end of the standing time just before carving. If it hasn’t reached the right temperature, take it out and finish heating it gently in the microwave while you carve the bird. Test again. The thermometer should be inserted into the center of the thickest part, away from bone, fat and gristle. if you don’t have a thermometer. Open your non-dominant hand, palm facing down. Press into the flesh between your index and thumb. Feel how soft that is? That’s what a rare steak feels like. Now bring your fingers and thumb in together and feel the flesh. It will be firmer. That’s what a medium steak feels like. And lastly, make a fist and feel how firm that flesh is now. You got it! That’s a well-done steak. The thermometer needs to go deep into the thickest part of the meat. That’s easy to do with a meatloaf or deep quiche. When I test burgers, I use tongs to turn the patty on its edge so I can insert the sensor sideways. If you just slide the thermometer through the top of the burger, not enough of the sensor comes into contact with the meat so you get a false reading. It's also important to learn what is the MINIMUM INTERNAL COOKING TEMPERATURE of the food you're cooking. This link will take you to a complete chart. Return to HOME from Meat Thermometers.